Complex queries may require combination of separate nested subqueries, built and saved as independent queries. However, there are may situation where we transparently generate simple inline subqueries within your current query. These are single-field independent (SELECT field FROM table) subqueries. 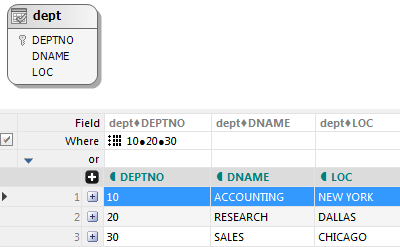 Back to your first query, change the In Field Values by the Equals (=) operator. 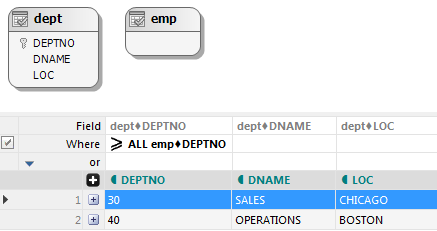 You get the WHERE dept.DEPTNO = (SELECT DEPTNO FROM emp) inline subquery, which expression may be confusing for some platforms and throw an error. 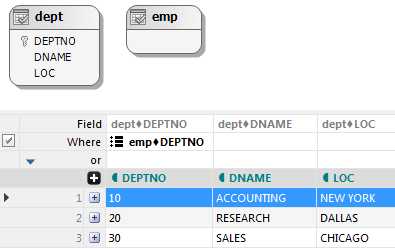 More, if you used at least one field from emp as a select field, you may not get a subquery at all, but the simple equivalent of an equi-join as WHERE dept.DEPTNO = emp.DEPTNO. It’s also not very clear if you want to compare your left-side value to ALL values from emp, or just to SOME or ANY value that provides a good match. To avoid all this confusion and always get an inline subquery, provide an additional inline aggregate function you’ll find now in the contextual menu, which is Any value from. This tells us: compare dept.DEPTNO with values from emp until you find a good match (if any). 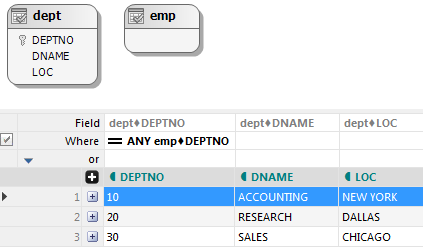 The filter translates into WHERE dept.DEPTNO = ANY (SELECT DEPTNO FROM emp) and this returns the same result as our first query (to exclude ALL values found in the emp table, use the opposite <> ALL emp.DEPTNO condition). SOME is synonym of ANY. Read why we recommend it instead and why it’s good to leave the Use SOME switch on, as it is by default. 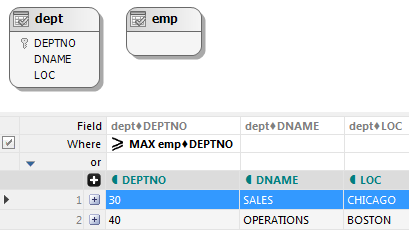 Unlike All and Any – which may be applied only to a comparison operator – regular inline aggregates may also be applied to individual fields, in the Field builder. To conclude, inline subqueries help you generate on-the-fly some simple subqueries with no need to build and reuse separate independent queries as nested subqueries.